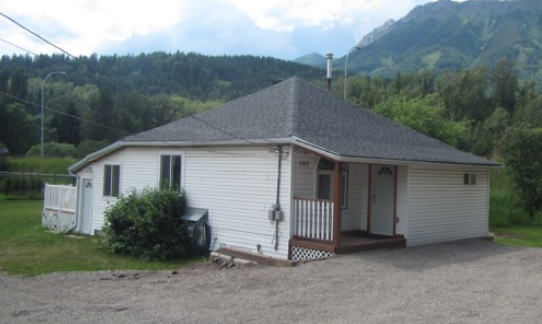 *** Sorry Rented *** Located close to the Elk River (1 block) this home is located 5 blocks to downtown Fernie. This properties location makes it walkable to all that Fernie has to offer, restaurants (1 block to the first restaurant), theater, banks, shops, trails (trails start right across the street from the house), etc. The house is also right across from the hitching post, this is the best place to get a rides to the ski hill in Fernie if you don’t have a car. This home is made for the new economy. Small but spacious with 9ft ceilings, 2 bedrooms, 2 bathrooms, mid-size dining room, full unfinished basement, deck and lots of outside space. Have mature apple trees in the back yard. You are within 50 meters of the Elk River, walking trails and mountain bike park. If you wish to go out the restaurants the first one is within 2 blocks. Downtown Fernie 5 blocks walk. The ski hill and golf course are 5 minutes drive. Fully renovated in 2004, new windows, new laminate floor, new furnace, hot water heater, new fridge, dishwasher, microwave, new on-suite bathroom, renovated main bathroom. Includes washer and dryer and dry basement for storage. This is a very energy efficient house with winter (Dec – Mar) heating cost at approx. $100 – $150 per month. This is a fully furnished house and includes beds, some dishes, (assorted linens), TV, etc. Will rent furnished only. Summer (furnished) rental: (6 months min. max. 4 people $2,000) plus utilities. (3 months min. max. 4 people $2,400) plus utilities.